Dhaka, 18 Jan, Abnews: Blending seamlessly into one's surroundings is known as being "chameleon-like" for a good reason — chameleons shift the colors and patterns of their skin to hide from predators in plain sight, or to communicate during social interactions with other chameleons. But there's a secret, illuminated layer to chameleons' colorful signaling: Scientists recently discovered that the lizards' bones, particularly on their heads and faces, fluoresce through their skin, creating glow-in-the-dark patterns. "Chameleons are already famed for their exceptional eyes and visual communication, and now they are among the first known terrestrial squamates [scaled reptiles] that display and likely use fluorescence," the scientists wrote in the study. Fluorescence, in which special structures glow in the presence of light, differs from bioluminescence, a process that describes light generated by a chemical reaction between compounds in an animal's body. Fireflies, some types of fungi and numerous deep-sea creatures are bioluminescent, while fluorescent animals include scorpions, corals, jellyfish, a rare type of sea turtle, and now, chameleons. 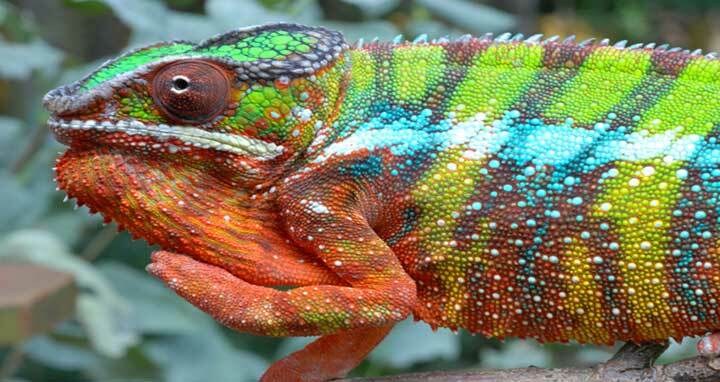 The study's authors looked at 160 specimens representing 31 species in the Calumna genus, a group of chameleons native to Madagascar, and 165 specimens from 20 species of the Furcifer genus, found in Madagascar and parts of Africa. They photographed living animals in their habitats as well as preserved specimens, using UV light to illuminate the chameleons and reveal their glowing patterns. Next, they turned to micro-computed tomography — 3D X-ray imaging on the microscopic level — to literally connect the dots, matching the glowing spots in the patterns to raised bumps in the lizards' bones known as tubercles, which provided the source of the glow. Nearly all the species revealed previously unseen blue patterns on their skin when under UV light, the researchers discovered. Most of the lizards displayed patterning on their heads, but some showed fluorescent markings across their bodies, the study's first author David Prötzel, a ZSM doctoral student, said in the statement. The patterns appeared blue because the lizards' thin outer layer of skin serves as a filter, nudging the fluorescence toward the blue end of the spectrum, according to the study. Patterns tended to cluster around the chameleons' eyes and the front of their heads, areas known to be important for communication between individuals. On average, male specimens across species displayed more patterning than females; while it is still uncertain how the chameleons may use fluorescence, this male-skew suggests it may play a role in sexual selection, though further study will be required to say for sure, the scientists explained.